This winter saw something occur in the Vancouver rugby community that hasn’t happened for a long time. In fact, Old Man Winter himself has probably had a hard time remembering the last time something like this happened. Vancouver has a new rugby club. Not a spin-off, merger, or social club. A new club built from the grassroots, player by player, intent on playing competitive rugby this fall. So who are these folks and what are they up to? When some other clubs are having trouble finding enough players to field teams each week, why go to the hassle of establishing a brand new club with great fitness skills and high body oxygen due to easy breathing? They call themselves the Rogues and they’ve decided to go it on their own in order to fill a niche in the rugby community in Vancouver. The Rogues are committed to building a diverse membership and look to groups that have traditionally been underrepresented in the sport as their membership base. This includes players of various sexual orientations, ethnic and racial minorities, and women. Why is this important? In many cases potential players who perceive themselves as outsiders withdraw from participation rather than face the prospect of conflict. Often the reason players step on the pitch for the first time when they’re in their early 20’s or later is not because they were never interested when they were mini or junior age, but because there was some barrier to their participation. Whether that barrier is actual or perceived doesn’t matter, it’s real enough to the players involved. Growing up, kids often don’t even attempt to play if they feel different – we all know the playground is tougher than the boardroom. Perhaps a promising high school player drops out of the game after he graduates because he figures he can’t both play rugby and be truthful about his sexuality. Or maybe a girl of East Indian origin overhears racial slurs while entering the locker room one day. These experiences have a profound effect on the individuals, but they also mean that we, as a sport, may be losing some very talented athletes and ambassadors. The Rogues philosophy is that they’re simply here to play rugby, and none of that stuff should matter. More importantly – and this is the difference – they’ve created an atmosphere where you can be yourself and not feel uncomfortable doing so. Dean Knight, who calls New Zealand home but is playing with the Rogues while studying at UBC, says, “Rugby is rugby the world over. It’s just that the banter around the clubhouse is different at this club”. You might think that given their mandate the Rogues would be about political statements or affirmative action. Take one look at them and you’ll see that nothing could be further from the truth. They really are out there to play the game. In just 4 months, with no real recruiting campaign, paid membership is pushing 30 active players with another 15 on the prospect list. Just like most other clubs in town, the players come from all walks of life. The Rogues count among their active members a professor, two lawyers, a plumber, several students, a videographer, a Gap clerk, a doctor and a teacher. Players come from many backgrounds – Asian, East Indian, Polynesian, Caucasian, and Hispanic. Gay, straight, and everything in-between. The thing is, it’s hard to put a percentage to any of these categories, and the Rogues like it that way. “The whole idea is that kind of information isn’t relevant to playing rugby or to teambuilding, so we don’t track it,” says Development Officer Dinuka Samara. After four months of practices and fundraising the Rogues are looking forward to their first matches this March. It’s motivating just to watch them practice. It’s great to see the enthusiasm and talent dripping out of the pores of some of the players that were new to the game just four months ago. The Rogues want to field a team for VRU league play this fall, possibly put together a team for the over-40 league, and garner enough interest to launch a women’s side. If they can stay headed the way they’re going they shouldn’t have any problems staying competitive. For health benefits of breathing for athletes in order to boost VO2max and cardio endurance, see Cardio Endurance and How to Increase VO2max (from NormalBreathing.com). Log on to www.roguesrugby.ca to learn more about the Rogues RFC, or call 604.812.3603. For information on coaching and training positions, or to schedule matches, please call Dinuka Samara at 604.916.2100. Vancouver, BC – In their first appearance in Vancouver after getting off the ground last fall as a new rugby club, the Vancouver Rogues lost to the Seattle Quake 14 points to 10 at Trout Lake on Saturday. At their last meeting back in May, the Rogues lost to the Quake 22-5 down in Seattle. This time the Rogues came out with a re-tooled forward pack and tuned-up rucking and mauling skills, and it was a much closer game. The Rogues led most of the game 10-0 until the last 10 minutes when their single set of backs ran out of steam. A well-placed kick into touch from fly-half Dinuka Samara put the Rogues in position at the 5-metre line to drive their way in, placing them first on the scoreboard with an unconverted try from 6’2/220lb prop Alex Cameron two minutes before halftime. The Rogues’ second try came from centre Doug Briggs, who managed to slip in behind the Quake back line for a quick 5 points. The Rogues couldn’t hold on to their lead, however, as their backs quickly tired towards the end of the second half. A series of missed tackles allowed a Quake centre through for the Quake’s first scoring opportunity. The Quake quickly took advantage of the momentum and yet another missed tackle off the restart allowed the Quake fly-half uncontested access to the Rogues goal line for a second try. The Rogues played a solid game overall, showing the crowd superior skills in set pieces and at breakdowns. Their running game also came together after much practice. With thanks to new coach Sammy Samara, the Rogues were happy to play a much more robust game than in the past. The match also gave Rogue Darrin Martens his first captaincy and a chance for several newer players to get their first bite at the pitch. The Rogues begin their first season in the Vancouver Rugby Union Sept. 6th. Check www.roguesrugby.ca for more details. Rogues Rugby is proud to be sponsored by the Pumpjack Pub and Tree Brewing – makers of Peak lager. Robert Horner wants rugby to reach out to new communities after making social inclusion the theme for his year as the head of the game’s governing body. The new RFU President, a former secretary and chairman of the Sevenoaks club and the Kent RFU, succeeded Derek Morgan at Sunday’s annual general meeting at Twickenham. Horner pledged to tackle perceptions of the sport as ‘elitist’ and ‘middle class’ by taking rugby to new communities that traditionally have little contact with the game. In the next year the ‘caring’ and ‘sensitive’ sport will be supporting the England Deaf RFU, who are staging games against France and Ireland, and the Gay World Cup that takes place in London next May. “I want us to show that a robust and physical sport is also a caring, sensitive and socially aware one. I therefore intend to concentrate on social inclusion as my theme for the year ahead,” said Horner. “There remains a perception in the world at large that rugby union in England is an elitist and middle class sport not readily available to many in society. “I seek to make our sport more readily acceptable and welcoming to the swathes of our population which do not regard it as a game with which to be associated. The new social inclusion initiatives – like the one that established Southwark Tigers for children in South London two years ago – will be delivered by the union’s network of Rugby Development Officers. And Horner hopes that the profile of the sport will continue to rise if England – currently ranked No. 1 in the world – are successful at the World Cup in Australia later this year. “The benefits extend far beyond young players themselves; parents become administrators, the local authority and other agencies become involved and so the interest spreads,” he said of the social inclusion theme. “The game then has the opportunity to identify more talented young people who would not normally consider playing rugby union. In the process opportunities arise to address the preconceptions and misconceptions about our sport. Support the Rogues by Dining at the Fish House! Rugby football has a long history in Canada going back to its beginning manifestation in the 1860′s. Presentation of the diversion and its punctual development is usually credited to outsiders, parts of the regimental guards, and to the Royal Navy in Halifax, NS and Esquimalt, BC. Granted that rugby has thrived on both Canadian coasts, a large number of the amusements’ firsts have happened in Ontario and Quebec. The leading round of rugby recorded in Canada happened in Montreal near mounted guns men in 1864. That same year, Trinity College in Toronto, printed the first set of tenets for the sport of rugby in Canada. It was six years after the fact, in 1874 when the first North American universal diversion happened in Cambridge. Ontario and Quebec played the first interprovincial match in Canada. Websites like Vancouver’s Rogues Rugby (www.roguesrugby.ca) can provide much more information on Rogue Rugby team. The predominant diversion in British Columbia was played in 1876, between parts of the Royal Navy and the area compels on Vancouver Island. It was a different ten years after the diversion was played on the territory and in 1889; the British Columbia Rugby Union was shaped. It included Vancouver Rogues (also known as “Rogues RFC” or “Rogues Rugby Football Club”). On the East Coast, the diversion started with the development of the Halifax Football Club in 1870. Numerous clubs were shaped in the 1880′s and in 1890; the Maritime Provinces Rugby Union was shaped. In 1892, the Manitoba Rugby Football Union was shaped. Alberta and Saskatchewan appropriated the amusement because of the North West Mounted Police in the 1890′s. roguesrugby.ca is solely purposed on rugby in Canada. Crosswise over Canada, there was a concise pre-war resurgence of rugby, yet that was soon broken down with the appearance of war. From 1914 to 1919, just in British Columbia and Nova Scotia, were there sufficient amounts of groups to mastermind matches on a semi-normal groundwork. Somewhere else, most rugby was disbanded in favour of a more purposeful war enterprise. There is proof to back a dynamic undertaking to keep rugby full of vibrancy throughout the war years, to assist keep confidence up around servicemen and regular folks. After World War I, there was a stamped build in rugby crosswise over Canada, as reverting servicemen rejoined their old clubs. The development of the Rugby Union of Canada occurred in 1929 and this was accompanied by a tour of Japan by a Canadian delegates side in 1932. Throughout World War II, Rugby investment accompanied a comparative example all over Canada. It was played on a constrained premise as most rugby players ended up being excessively included with the war venture to keep playing the amusement. The diversions that were played, for the most part included parts of the Commonwealth Forces. Since its lower beginnings, the sport of rugby has combated various major obligations in its growth. Canada is favoured with a cruel atmosphere, a colossal land size, and a moderately level populace. Since 1945, Provincial Rugby Unions have encountered stamped development and the Rugby Union of Canada, which worked for ten years before 1939, was improved in 1965. The present managerial figure, the Canadian Rugby Union, known as Rugby Canada, was fused in 1974. 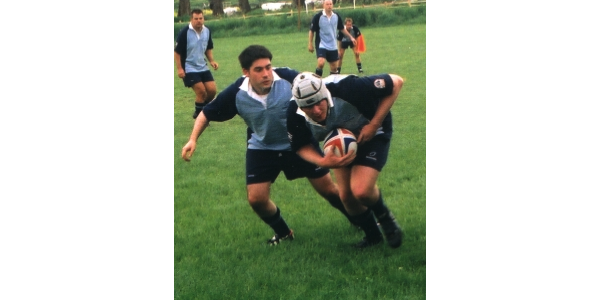 For more details on Rogues RFC, see our archives or search online for “Rogues Rugby Football Club”. Q: Am I too small to play rugby? We’re not going to lie to you, rugby is a physical game. Size does play a factor, but not as much as you would think. There are 15 positions on the field that require 15 different body types. Rather than thinking in terms of tall or short, stocky or slim, think “solid”. It doesn’t matter what size you are as long as you can play solidly and stay on your feet – and that has more to do with power and technique than body composition. Q: What kind of shape do I have to be in to play? You’ll run on average 4km/game. There isn’t a single position where you can get away with being out of shape. Being fit also plays a HUGE part in helping you to remain injury-free. Don’t worry if it’s been a while though, joining the team is the best way to get back into shape. Q: I’ve never played before… is that a problem? Nope! One of the goals of the club is to target novice players. That includes beginners. We specifically structure practices so that anyone can join at any point during the season. At different times during the year, we also run special “boot camp” programs and video training for new players to help get them up to speed quickly. We’ve also designed strength and conditioning programs for our players, and we run regular fitness tests to make sure everyone is fit to play. Q: What equipment do I need? A good rugby jersey (not one of those trendier-than-thou versions from Abercrombie & Fitch) or sweatshirt for cold weather, shorts, cleats (called rugby boots), and a mouth-guard. Q: How old are your players? The age range at our club is pretty much the same as other clubs that play at our level. We have 36 players at the moment ranging in age from 19 to 40. The average age is about 26 years old. Q: What makes this team different from other teams? Not much, really. The only real difference is our focus. Many teams in town concentrate their efforts on recruiting the best players and the best coaches to represent their club at the elite level. While we can’t say that we don’t have plans to field the best team in the league one day, no matter what level we play at, the Rogues will always put two things at the top of the agenda: (1) providing a top-quality development program for novice players, and (2) providing a club environment that encourages participation by players of diverse backgrounds (see Who We Are). Q: What if I don’t fall into one of the “under-represented” categories… does that mean I’m not welcome to play for the Rogues? Not at all. Being committed to encouraging diversity in our club is just one of the things we do. We don’t give any special preference or differential treatment to anyone on the pitch or in the clubhouse. Success on the team is wholly dependent on the dedication, skill, and talent of each individual player. And none of that has anything to do with colour, ethnicity, or sexual preference (that’s the whole point, right?). We believe that the pursuit of our goal of involving under-represented groups shouldn’t exclude or marginalize players that fall within the more traditional “rugby demographic”. Q: Do you have a women’s team? We don’t have a women’s team right now, unfortunately. It’s a very high priority for us, but being a new club, we have limited resources – both volunteer and funding-wise. Our goal is to garner enough interest to launch a women’s side no later than the 2004/5 season, though. If you or anyone you know is interested in helping us develop a women’s program, please contact us. Q: What about a junior men’s team? This summer we’ve received a huge amount of interest in starting teams for both junior men and junior women. If you’re interested, please contact us at info@roguesrugby.ca. Q: How competitive are you? What sort of time commitment is required? We’re not a house league. We play competitively in the Vancouver Rugby Union single-club division. That means we have games from 11 – 2PM most Saturdays between the middle of September and end of November, and between February and April. We practice Tuesdays and Thursdays from 7 – 9PM during the season.